Sling TV has dropped support for apps running on Mac, Windows 7, Windows 8, and Windows 8.1 PCs. 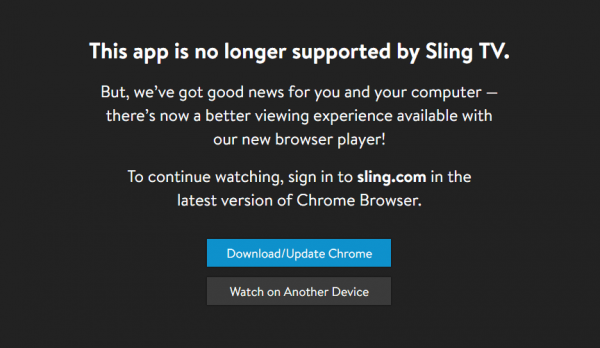 Instead, the company is asking customers to utilize their browser-based player through sling.com. “We’re focusing our efforts on adding new features to our newly launched Google Chrome browser player,” says Sling on an FAQ page. And, while Google Chrome is the preferred method of watching Sling TV on PCs, they say they are also working on a Safari version for Mac users. Funny enough though, Sling is continuing support for the Windows 10 app on PCs.